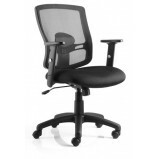 We offer a great selection of high back Mesh Chairs, Mesh operator chairs, Mesh task chairs and Mesh visitor chairs. 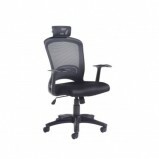 Portland Mesh Back Office Chair. 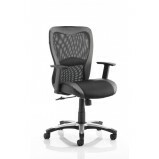 A nice mix of air mesh fabric seat and soft feel mesh back with built in adjustable lumbar support. 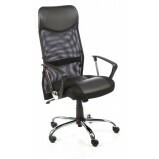 Adjustable arms as standard, this is a popular all round chair for home and office. Features Ai.. Mesh backrest Black fabric seat with posture curvature Lumbar support Adjustable headrest Gas lift Fully reclining tilt mechanism Tension control adjustable for individual body weight a Adjustable arm rests ..
Relay Airmesh Chair. 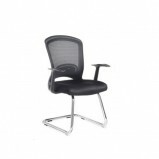 The Relay chair has a modern style with silver accented base tops and chrome gas lift. Breathable mesh back and vent effect back cover. 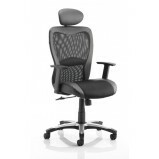 Complete with folding arms this makes a versatile chair for all office environme..
Sanderson II Black Fabric Mesh Back ChairWhen efficiency is all-important, Sanderson task seating fulfils a variety of functions. 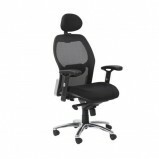 These chairs ensure employees have comfort and the functionality required as their legal right. 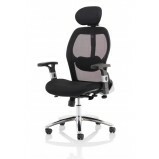 Th..
Solaris Mesh Office Chair The Solaris mesh back office chair offers a new style moulded back with mesh upholstery for added strength and user comfort, The Solaris chair includes a pivoting headrest, deep padded seat and fixed arms all to..
Solaris Mesh Visitors Office Chair The Solaris mesh visitors / reception chair is an ideal match for the Solaris managers chair, With features including Chrome base, Fixed arms and Deep padded seat not only is this mesh chair comfy it is..
Sleek elegant and refined Soft mesh back Leather headrest Gas lift tested up to 150kg .. 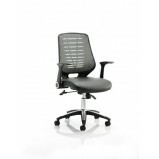 Contemporary mesh and leather design with contrasting detail Mesh back with bonded leather surround Air-mesh and bonded leather seat Thick comfortable padded seat Gas lift tested up to 150kg Options Available wit..
Zico Mesh Back Office ChairThe stylish Zico mesh back task chair by TC Group is a generously proportioned with breathable mesh . 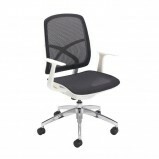 The chair has a white frame work to compliment the black mesh upholsteryFeaturesSynchro mechanism8 Hour us..